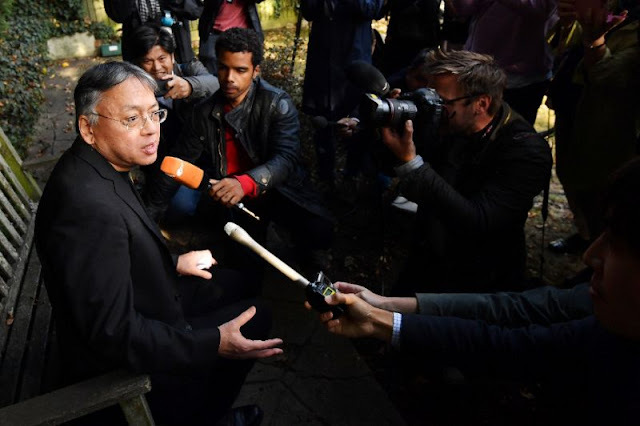 Tokyo - The Japanese publisher of Nagasaki-born Kazuo Ishiguro said Friday it would republish eight of the British author's books in translation, reporting "a huge number of orders" after he won the Nobel Literature Prize. Japan had been pinning its hopes on its best-known novelist Haruki Murakami to win the Nobel Prize but eagerly claimed a link to the British winner with Japanese roots. "Since last night, we have received a huge number of orders. We're very happy," a spokeswoman for Ishiguro's Japanese publishers Hayakawa told AFP. "We have decided to reprint the eight works that we have already published in Japanese," she said. Ishiguro's best-known novel, "The Remains of the Day," is among the works that have been translated into Japanese. Government spokesman Yoshihide Suga told reporters on Friday that Japan congratulated its native son "from the bottom of its heart". "His novels are also read by many Japanese and they have been turned into a play and a TV drama," said Suga. Nagasaki mayor Hodo Nakamura also congratulated Ishiguro, saying it was an "immense honour" for his city. Both his first novel, "A Pale View of Hills" from 1982, and his subsequent work, "An Artist of the Floating World" from 1986, take place in Nagasaki a few years after World War II. The Japanese publisher of Nagasaki-born Kazuo Ishiguro said Friday it would republish eight of the British author's books in translation, reporting "a huge number of orders" after he won the Nobel Literature Prize.